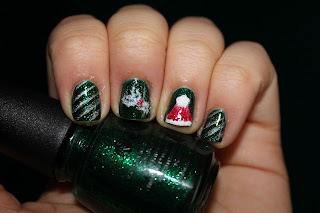 See Sarah Swatch: Christmas Skittles! Hello all!! I'm sorry if I'm not too wordy today, I have 2 finals tomorrow and then a final and term paper on Thursday. So not too much fun :/ But then it's break! Yay! I'm very excited. I need to not do anything haha. 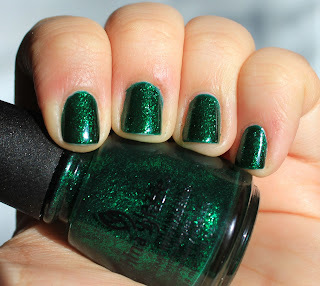 Anyway, I had on 2 coats of Emerald Sparkle, aka one of my absolute top polishes. It's so freaking PRETTY. Plus, green and glitter, so I'm sold. Santa Hat: dotted a triangle of the SH white, then dotted on China Glaze Poinsettia, then CG Ring in the Red, then made the little ball at the top and the lining by dotting on the SH white. 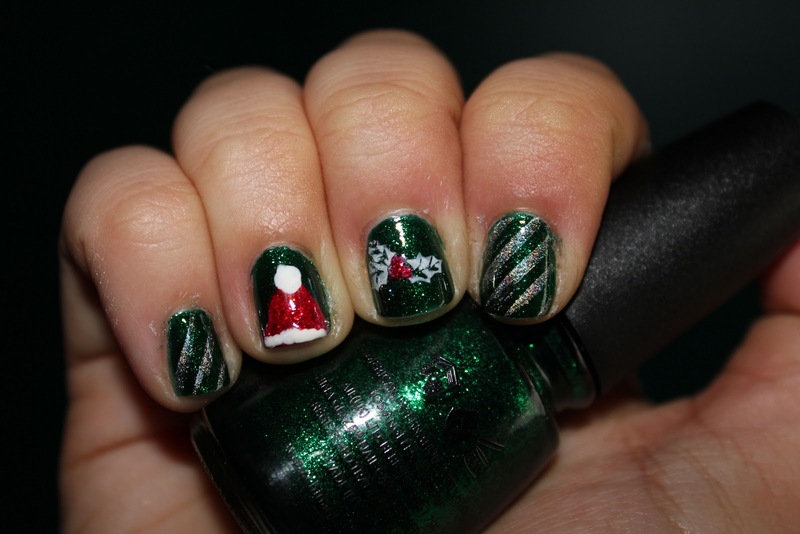 It wasn't really hard, though I think I like the Santa hats most:] I'll probably do this exact mani for Christmas day haha. Plus, it was a hit with my housemates! 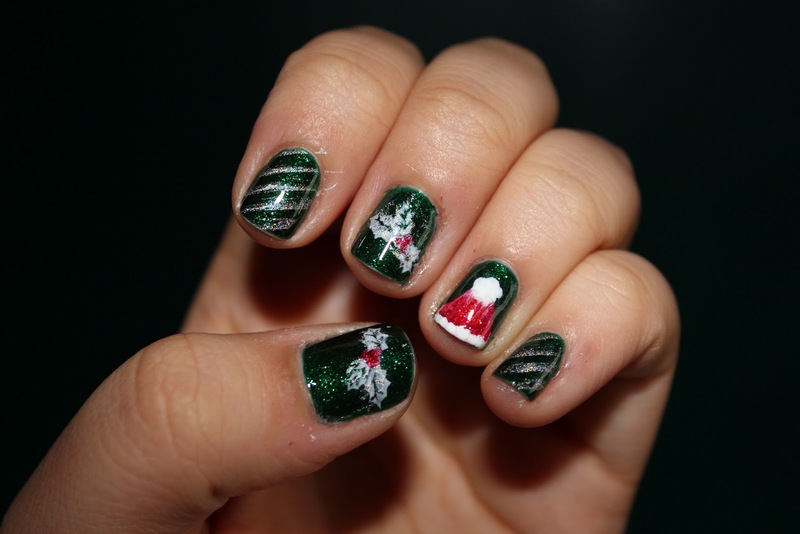 Very festive- I love it! 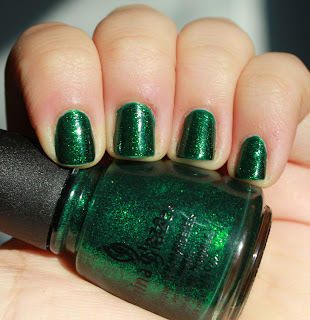 I need Emerald Sparkle! It's so pretty and I think it's shameful that I, a self-proclaimed green lover, don't have it. Great stamping, I agree that the Santa hats are my favorite as well! :) Very cute and festive. Look at you doing some nail art! Yay! Very festive! AMAZING! Love it.. this is so cute. I love the green. @ Chelsea, don't worry, I JUST got it like 2 weeks ago. I always held off, but then I knew I needed it for Christmas haha. GET IT. It's amazing. @ TopCoatIt, thank you!! you've inspired me to try more nail art!